So-called “hoverboards,” which don’t actually hover, are illegal to use on the streets of New York City. Two lawmakers are trying to change that, but their timing couldn’t be worse, as one of the self-balancing scooters caught fire in a Brooklyn apartment Tuesday. 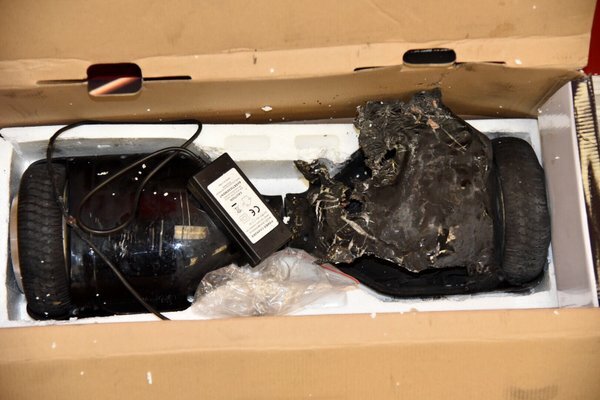 DNAinfo New York reports that a hoverboard started smoking and burst into flames as it was being charged on Tuesday evening. Fire officials say the owner of the device was able to quickly move it to the apartment building’s hallway before it burst into flames. Firefighters put the fire out a short time later. While no one was hurt in the incident, the New York Fire Department Tweeted a photo of the incinerated scooter. Fire Commissioner Daniel Nigro issued a warning Wednesday, telling New Yorkers that he’d personally steer clear of the popular scooters. The official’s concern about the devices comes at the same time that two New York lawmakers have started a push to legalize hoverboards. CNN reports that state senator Jose Peralta and assemblyman David Weprin are working to reclassify the devices in NYC, where the police department and Dept. of Motor Vehicles deem the scooters illegal. Hoverboards are considered to be in line with Segways, and other “personal transporters” that are prohibited under New York State law, the NYPD tells CNN. “There is no evidence to suggest that an all-out ban on hoverboards is in the public interest,” reads a statement from the lawmakers.